Artistic Director Darko Tresnjak wasn’t taking any chances. For this, his 25th production of Shakespeare’s works, his fifth in as many seasons at Hartford Stage and his first of “Romeo and Juliet,” Tresnjak not only directed, but cast his favorite actors and designed his own set, thus ensuring the integrity of his creative vision for this classic tale of star-crossed lovers. Bravo! Braving the controversy over “modernized” productions of the Bard’s plays, Tresnjak has preserved Shakespeare’s text all the while challenging his audience’s preconceived notions, stripping historic Verona down to a gravel pit, which serves equally well as town square, the friary, a meeting place, a hall in Capulet’s house and a burial crypt with naught but a rising/arched platform for variation. Ever prominent is a columbarium backdrop, engraved niches housing the cremains of the feuding Capulet and Montague families, a section of which transforms into Juliet’s balcony. The pièce de résistance, however, is an imposing stage-width “iron” gate that descends to heighten the final tragic scene. Tresnjak’s casting is impeccable. Chris Ghaffari’s Romeo and Kaliswa Brewster’s Juliet are perfectly paired. Ghaffari is the embodiment of the love-struck, swooning suitor, his expressions and movements playful and endearing. He delivers his lines so effortlessly that one tends to forget it is Shakespeare’s dialogue he is speaking. 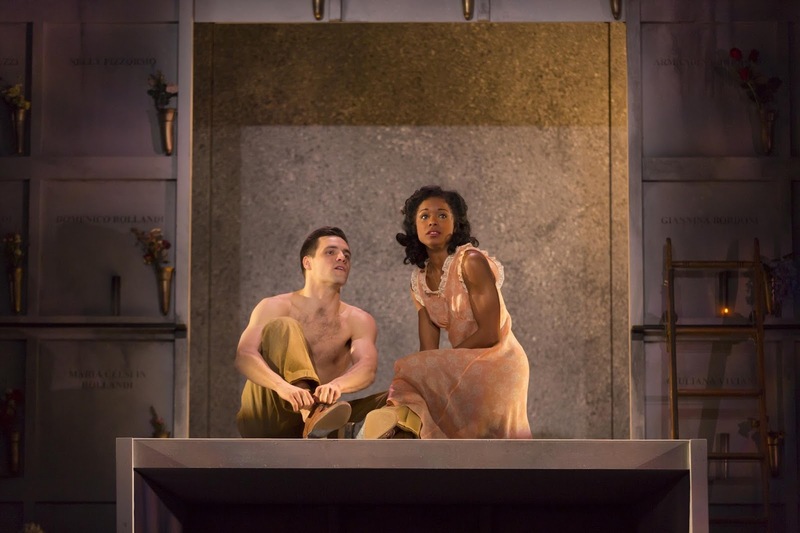 Brewster looks the part with her youthful features and convincingly dramatizes Juliet’s transformation from naïve 14-year-old to impassioned lover. The chemistry between Ghaffari and Brewster is tangible. The other actors are superb as well. Wyatt Fenner’s Mercutio is the poster boy for ADHD, especially in his dream ramblings. As Romeo characterizes him, “He’s a man who likes to hear the sound of his own voice.” Also notable are Charles Janasz’s embodiment of the compassionate Friar Laurence and Timothy D Stickney’s gripping performance as Capulet in his paternal demands of obedience from Juliet. Adding a touch of humor are Kandis Chappell's Nurse, whose disgruntled expressions speak volumes, and Raphael Massie as the illiterate servant Peter. Kudos to lighting designer Matthew Richards, whose shadows loom ominously during Mercutio’s dream narrative and over Juliet’s drugged form, and whose vigil lights hint of the hope that can emerge from tragedy.